The iPhone 7 is the first waterproof rated phone from Apple which can apparently stand being submerged in 1 metre of water for up to 30 minutes. It comes with a 4.7″ retina display screen and a 12MP camera delivering clear, vivid shots. It comes with a 1960mAh battery and Touch ID for security. 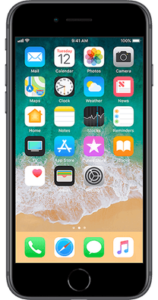 Compare iPhone 7 Deals below to find your perfect deal.